Digital UltraViolet and Digital Copy will makes it possible for you to stream the movie Sicario: Day Of The Soldado HD UV or iTunes Code instantly to your computer and compatible Smartphones, Andriod, iphone, iPod Touch, iPad and tablets devices anytime, anywhere. 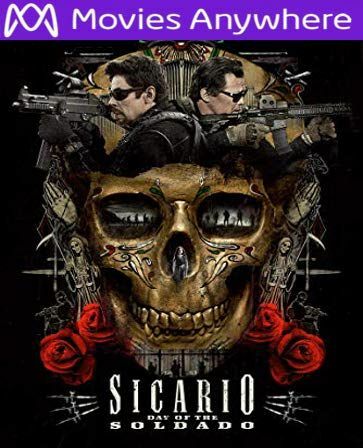 You can also download a Digital UltraViolet Copy or a Digital Copy of the movie Sicario: Day Of The Soldado HD UV or iTunes Code to your computer and compatible devices. "Sicario: Day of the Soldado" opens on a busy retail store in Kansas City. Shoppers mill about. Suddenly a loud explosion rocks the building. Then people are crawling on the floor. Someone is crying. A young woman clutches her little daughter to her as she inches towards the glass door. Slowly. Just ahead of them, a terrorist stares straight ahead . "Please. Please Don't. Please Dont" cries the mother. The terrorist pulls the pin, and another huge explosion rocks the screen. "Sicario II" has just begun. Dark. Brutal. Uncompromising. There are no heroes in "Sicario: Day of the Soldado". There are no good guys. It's a dark and dangerous world...Isn't it. "Sicario II" is well directed by Stefano Sollima. The screenwriter is multi-talented Taylor Sheridan, who also wrote the screenplay for "Sicario(2015)"(excellent), and "Hell or High Water(2016)"(quite good). He directed "Wind River(2017)". (amazing). The haunting, penetrating music score is by Hildur Guonadottir, who returns from "Sicario I". Also returning from the first film is Benicio Del Toro as Alejandro, and Josh Brolin as Matt Garver. Co-starring is little 17-year-old Isabela Moner as Isabella Reyes. She plays the teenage daughter of Carlos Reyes, a Mexican drug cartel leader. She's very good. "Sicario II" looks at the illegal immigrant business in Mexico, now dominated by the drug lords. Demand for cocaine and heroin is responsible for 12,155 homicides in Mexico from January to June in 2017. "Sicario II" is not a fantasy. It's not a cartoon. Hardly. Late in the film, Alejandro says to a young boy: "So you want to be a sicario....come on in....close the door...". "Sicario: Day of the Soldado" was filmed entirely in New Mexico. "Come on in...close the door..."